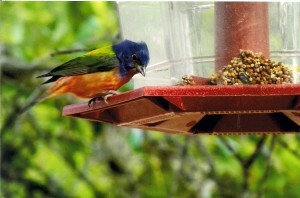 One of the male Painted Buntings that come to my birdfeeder. My friend June Chism has an app on her I-pod that gives the birdsong for any species. It is most amazing. We were riding on Allison Swift’s place and heard a low, descending chattering sound and June found it, played it, it was a Scarlet Tanager. Her I-pod chatters, whistles, chirps, and displays a picture of said bird; including the melodious field sparrow. Jack Vance has died at the age of 96, a brilliant, funny, endlessly imaginative sci-fi wrter although I think he should be called a fantasy writer. I just discovered him.